Hamilton Town Hall is located at 577 Bay Road, Hamilton, MA 01936; phone: 978-468-5570. Photo: Austin Brown House, ca. 1725, 1028 Bay Road, Hamilton, MA. Listed on the National Register of Historic Places in 1990. Photographed by User:Magicpiano (own work), 2013, [cc-by-3.0 (creativecommons.org/licenses/by/3.0)], via Wikimedia Commons, accessed September, 2017. The Town of Hamilton  was settled by farmers who tilled the fields to the south of Ipswich. Early settlers in Hamilton asked that their local church be "set off" from Ipswich due to the distance that the community in the "Hamlet" had to travel to downtown Ipswich for church. The forty families within the town did not find enough room for them at the Wenham church located to the south and decided to build their own church in 1713. After the Revolutionary War, they petitioned to separate into their own community. Finally in 1793, Hamilton became a town. The farms were originally scattered along early roads. By 1894, the railroad, (allowing easier access to information and traveling), the Industrial Revolution (encouraging the abandonment of rocky New England soils where machines were of little help), and the separation of church and state (decreasing community spirit) had all changed the fabric of many New England towns, but Hamilton managed to maintain its agricultural base. The early maps indicate that an increased number of smaller farms were now lining the roads. Many of these clustered farmsites also housed shoe shops which employed farm workers during the winter as well as full-time workers. The town of Hamilton experienced the influence of industrial or mill life with the presence of the Willowdale Mill, located on the Ipswich River. When the mill closed due to a fire in 1884, the population of the town decreased by 100 people. A few of the mill dwellings were relocated to Mill Street near the center of town. Many of the farmers who abandoned their farms gained employment through millwork and were able to keep their farmsteads. Due to the loss of employment opportunities with the closing of the mill, many finally abandoned their farms and moved to the industrial cities or to richer farmland in the West. By 1859, Asbury Grove, a 100 acre religious retreat, included 300 cottages, a chapel, tabernacle, hotel, spur railroad station and post office. Many of the gingerbread style cottages were burned in the fire of 1927 and were never replaced. While Asbury Grove was the first summer community to locate in Hamilton, Myopia Hunt Club was certainly the most significant. After the near-sighted friends (hence the name) moved their club from Winchester to Hamilton in 1891, wealthy Victorians began purchasing declining agricultural land for their country estates and summer homes, thereby preserving the rural quality of the area. Some moved the colonial homes back off the main street for privacy and added barns, pools and gardens. The land once cleared for farmland was beginning to be re-colonized by early succession tree species. Sixty years after the separation of church and state, the town hall was built in 1897 down and across the road from the First Church in the Historic District. The Wigglesworth Cemetery, located near the First Church and across the street from the town hall was dedicated as Central Park after the interred remains had been relocated to the Hamilton Cemetery. This park was later renamed Cutler Park. The Hunt Club and the associated estates employed the townspeople as caretakers, farmhands, gardeners, chauffeurs, grooms, kennel men, butlers, cooks, maids, housekeepers and laundresses. The blacksmith whose business had been on the decline was now specializing in polo mallets. By 1911, the variety of nonagricultural occupations far outweighed those of farmers. Carpenters, painters, paperhangers, masons, storekeepers, doctors, lawyers, animal brokers, milk dealers, horse trainers, florists, general contractors, railroad workers, and ice workers all worked in the town, and clerks and leather workers commuted to other towns for work. Women were employed as laundresses, clerks in stores, teachers, milliners, dressmakers, artists and bookkeepers. The settlement of downtown Hamilton where the service workers lived, began around 1880. The square area between Union Street and Main Street to Linden Street and Asbury Street had been completely built up by 1910. While the estates maintained an agricultural and rural quality, with their pastures now in the front yard, the service-worker neighborhood developed into a series of blocks within blocks, with similar houses for like-minded citizens. A separate town center developed in this area where Bay Road crossed the railroad tracks. A fire burned through a portion of Hamilton, destroying Dr. Cilly's farm located on the land at the northwest corner of Asbury Street and Bay Road across from the Community House. 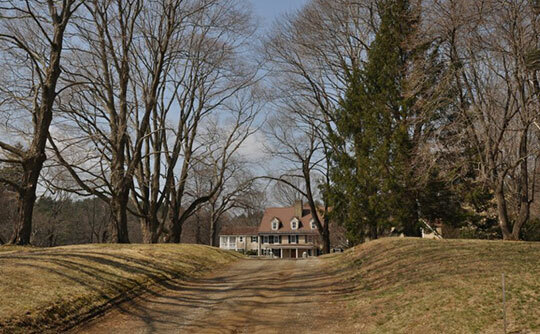 The farm was never restored, but was purchased by Myopia and used as a schooling field for their polo ponies until it was donated to the town in 1941. The Community House itself, designed by Guy Lowell, was built as a gift of George and Emily Mandell in 1921. As country places became too expensive to maintain, they too began to disappear with the infiltration of commuter neighborhoods during the 1950's. Much of what little agricultural land was left also fell prey to development. These housing tracts retained the names of the once lovely areas they destroyed, such as Harrigan's Meadow. The farmhouses, which were at one time moved back from the street when the summer residents bought the farm-land for estates, are now surrounded by half-acre, one acre, and two-acre house lots. A shopping center with a large parking lot is located at the railroad tracks in downtown Hamilton. The shopping center was renovated and expanded in 2002. Buildings along Railroad Avenue have been renovated and rebuilt in a more architecturally consistent manner, considering not only human scale, but regional architecture and color. The Historic District, located in the area where Cutler and Bay Roads meet, has remained true to its original character through restrictions. Hamilton Open Space Committee, Open Space and Recreation Plan for the Town of Hamilton, 2009, www.hamiltonma.gov, accessed September, 2017.